Greg Gaines has managed to perfect the near impossibility of being voluntarily invisible in high school, being generally friendly with everyone and never overly friendly with anyone. 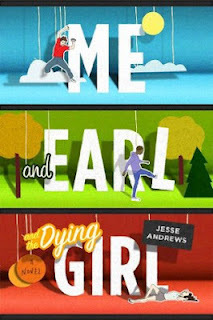 Except Earl, which is a different story since Earl generally wants to windmill kick everyone in the head and swear a lot, and except for Rachel, who gets leukemia in their senior year of high school. Greg's mom, who likes to insert herself into Greg's life in as many ways as she possibly can, decides Greg needs to be friends with Rachel, since when they were like 12 he sort of accidentally dated her when they were in Hebrew school. Basically, this is the story of Greg's senior year, told by him, and how Rachel got mixed up in it, and how his life got completely screwed up as a result. I'll warn you straight up: this book is full of curse words and disgusting language. Earl has the dirtiest mouth, and Greg's isn't pure as snow either. But that said, I started to enjoy it after a while. At first I was kind of turned off by it, but it has this rhythm, and plus it's just hilarious. I mean, I started thinking in Earl-speak toward the end, which is awesome and just ridiculous if you know me. The situations in this book might seem like they're going to be heartfelt and eye-opening for our main character, but as he'll tell you at least once a chapter, this book is anything but sentimental. Greg wants nothing to do with this from the start—he hasn't talked to Rachel in years, and it ended on really awkward terms back then anyway. He really has no idea how to act around other people that aren't Earl except to try to make them laugh, and though he succeeds sometimes, a lot of the time he'll put his foot in his mouth and just say completely idiotic things that blow up in his face. And honestly, it was kind of nice. This is not a coming-of-age story. Greg does not really grow up here. He realizes stuff about himself, but he's still kind of a jerk throughout most of it. Earl is pretty awesome, but no miracles happen to him either. Earl is a tough kid who'll beat you down if he feels like you deserve it, but he's got a good heart and knows the right thing to do, and won't be afraid to do it. He'll cuss like a sailor all the while, but whatever. People aren't perfect. This is a bizarre little book, but I liked it. Even though Greg doesn't seem to think he learned much from the experience, if anything he learned how to avoid these situations in the future, it doesn't really matter. We see what unfolds, and that's what counts. And did I mention this book is mainly funny? How often do you find a book about a dying girl that's so full of humor, and gross humor at that. Like, you don't even want me to tell you. I don't even want to tell you. Just... just go read it. If you're curious. Disclosure: I got this e-book from NetGalley. I laughed so freaking hard while reading this book. You're right. Earl has the direst mouth of any character I have came across, but I loved that little half pint. (Us short people have to stick together.) I cannot wait to read more from this author! I loved this book. I thought Earl was one of the best characters I've seen in YA because he is so real.